When we laugh even the jnani laughs. When we weep, even the jnani weeps, jnanis actions are like that of a new born child’s. But there is a difference between a child and jnani. The suppressed hidden tendencies in a child’s heart roar out as the child grows. But the tendencies are completely burnt into ashes in case of a jnani. A person possessing tendencies can never become jnani. Only those who serve jnani can become jnani. Jnani thinks that he has a body but never considers himself to be a body. Jnani never looks upon the world to be different from him but considers as a part of him. Jnani has no duties to be performed, but work happens through him by which he is never bound. In the Gita the Lord said – “I love the devotee, I love the yogi” but coming to the case of jnani, he never said that he loves/likes jnani. Instead he said “there is no difference between jnani and myself” Jnani obtains me “When God himself cannot describe the glory of jnani, how can we attempt to do so? I made my way to SR Nagar flat where Sri Nannagaru was staying. I entered the flat and saw him after 6 months. He was sipping his coffee. I came and sat to his right and wondered whence he would see me. He had come for a devotees wedding and as I was not invited I wondered as to how to attend that wedding. Then Sri Nannagaru went into Silence. He was in that state for a few minutes after which he started growling like a tiger. This is Lord Narasimha who is eating away our vasanas and ego I thought excitedly. I looked on at Sri Nannagaru. Sri Nannagaru opened his eyes and looked at me. He was in Silence for sometime then did namaskar and got up. He walked around the room amongst the devotees. He came across a family whose male member was a pilot of a helicopter. He had died recently in a crash with others. Sri Nannagaru now looked at me. He said this and his hand raised in the mudra of the blessing. I was awed. I clearly perceived Lord Sri Ramachandra in him and prostrated mentally to the Supreme Darshan. Sri Nannagaru kept looking at me and kept smiling. I was blessed for in Him I saw the Lord Rama. The Sweetheart of Sita, the doll of Anjaneya, the darling of Laxmana! This is a great day I thought. Sri Nannagaru has given me darshan as Lord Sri Ramachandra. I kept on looking at him and soaked in his grace. 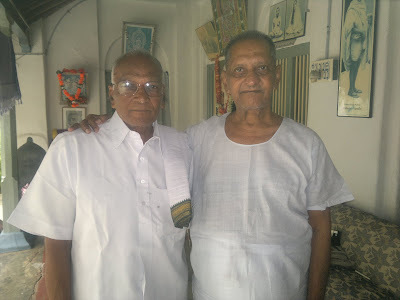 In the evening I again met Sri Nannagaru in the wedding reception. He made me sit next to him and asked me whether I was attaining peace. I frankly told him that I was not and had been in the midst of severe personal problems for the past few months. He nodded concerned and made in depth enquiries into the problem and offered practical solutions. He looked at me and smiled a heavenly smile. He then called many devotees and told them to see that I have my dinner without fail. He extracted my word again and again and then left peacefully on my assurance. I was amazed at his love. Later I understood the reason. During dinner a number of devotees surrounded me and asked me about my experiences with Sri Nannagaru. I told them as many and many started to collect around me drinking in my words. I understood that Nanna knew that this satsangh was bound to happen and hence made me come for dinner. He had told me months back ' Whatever experiences you have about me, whatever you see in me Share it with others. Without God’s Grace, none can ever become Jnani. Things happen to jnani as per his prarabdha Karma but the jnani is never disturbed by the gains or losses that arose from the fruits of his activities. The bodily comforts are incomparable with the happiness that arises from self-experience. A performer of miracles need not be a jnani. Only the one possessing equanimity and love can become a jnani. He is not a jnani who brings a corpse alive, but he is a jnani who lives like a corpse. He becomes a yogi who leads a moderate life. One need not become jnani by stop eating or growing long hairs. A person who is extrovert can never become jnani but only a person who is introvert can become jnani. A jnani looks upon an atheist also as god. He is a jnani who experiences the bliss of deep sleep in the waking state. Many jnanis took birth in this world. But no two jnanis travelled in the same path to obtain jnana (self). The ancient abodes of jnanis have now become the places of pilgrimage. Punya (fruit of good deeds) or Papa (fruit of sins) is brought only by the body or mind. He only becomes jnani who dedicates them (body & mind) to God. Earn bhakti (Love for Go) as you are earning money by working hard. Bhakti is a Ganga. The salt named ego melts in this Ganga (Bhakti). There is no mukti (liberation) for those who lack bhakti. One thing I forgot to tell was before going for his dinner there was a small moment in the room where Sri Nannagaru had asked me " You came today. When are you returning?" Sri Nannagaru's smile was wiped out and his face assumed a very sad expression as if he was going to miss me. What did I do to deserve this love? I thought. Now after having finished his meal he gestured me to accompany him to lighting of the Deepam on the front yard of Sri Nannagaru ashram where already hundreds of devotees were waiting. As we walked through the seated masses they bent and touched the ground hallowed by the Guru's feet. We reached the Deepam placed in the courtyard. It would be lighted by Sri Nannagaru once the Maha Deepam on Arunachala would be lit. As I came and sat at the feet of Sri Nannagaru I could hear the whipsers of devotees around "Who is this boy?" Suddenly the Deepam on Arunachala was lit! There was an applause all around. Sri Nannagaru got up and circumbulated the Deepam. After having finished thrice, he saluted it and asked me to do the circumbulation. I got up and did the circumbulation twice. He held me when I was about to start the circumbulation third time and asked the photographer to take a photo of Him and me. This was out first pose photograph together. After the snap was clicked he asked me to complete my circumbulation. I completed it as devotees chanted 'Arunachala Siva'. I sat down and looked at Sri Nannagaru and wondered at his compassion. After the chants Sri Nannagaru left for his room. I decided to go for circumbulation when I was surrounded by devotees asking me as to who I was. One lady came and told me " Sri Nannagaru has talked a lot about you to us." "What did he say? Please tell me." I asked. She said "He said that you a Jnanaputra-Son of Jnana. That you are a ripened fruit. He said that you are a very ardent devotee of the Divine Mother and have worshipped Goddess Gayathri all the time." I was surprised. I had never worshipped Goddess Gayathri in this life of mine atleast. I was also touched by his Love. Another aunty came and offered me dinner. I refused and told her that my stomach was full after Sri Nannagaru ate. She looked at me surprised. After this a few aunties and myself started for Girivallam. I looked at Arunachala and said "This is my first Girivallam on Deepam and on a Full Moon. Let it be that all my enemies, all the people I despise, all the people I hate, am jealous and indifferent to be more successful and prosperous in life than me. This is my prayer on my maiden Deepam Girivallam." The moment I said this prayer an unknown fear crept into me whether I had done a mistake by praying such. But the next moment I dismissed it and started for Girivallam. I finished the Girivallam in 4 hours and came back to Nannagaru ashram at 12 midnight. I had my first meal then after prostrating to the room in which Sri Nannagaru was sleeping. I returned to my room in Ramanashram. I was very scared that night in Sri Ramanashram. Sri Nannagaru told that I would have Truth Realization in this life. Will it happen today? I wondered. I was all alone in Ramanashram and Arunachala was just outside the door. I was scared. What will happen to my family, my wife, my child if I realize the Self? In the morning I woke up, happy that I did not have any Realization in the night. It was then that a vasana in me crept up and I was feeling ashamed and unhappy. This is Arunachala, Ramanasharam! And here I was full of vasanas, mind thoughts, evil thoughts, I felt dejectedly. How am I going to face Sri Nannagaru? I was at a wits end. I slowly got up and got ready. I went out and saw Arunachala. It was IMMENSE, MAJESTIC, beyond the MIND and BODY. I thanked Ramanashram authorities for the accommodation. It was then that my eyes rested on the book "Annamalai Swami - Final Talks "
I decided to buy it later. I went and did pradakshina of Bhagawan Samadhi and Mother shrine. It was then that I overheard some Andhra devotees tell amongst themselves that Sri Nannagaru would be coming to Ramanashram and that he had suddenly told it in the morning. I reached Sri Nannagaru ashram where there was a cow worship going on. Sri Nannagaru was saying "Dedicate the cow to Arunachala"
Yesterday night while doing Girivallam I had thought that it would be nice if I got to circumbulate Sri Nannagaru. I had told this to Gopika. Seizing my chance I quickly completed 20 Sri Nannagaru pradakshinas as he was in the middle of the crowd. Gopika smiled at me and said " So, you got your chance." I asked another devotee "Is it true that Sri Nannagaru is coming to Ramanashram?" "Yes," she said "it seems he made an impromptu plan in the morning. We are thinking that it is because he wants to see you that he is coming." I felt it was highly unlikely. I went upto his room after the pradakshinas where I met him. "I am going to Ramanashram" He said. "I will come" I replied still feeling guilty to look at him because of the vasanas I had had in the morning. We followed his car to Ramanashram. He directly went to the book stall and I followed him. He took out the book "Annamalai Swami - Final talks" and browsed through it and replaced it. This could not be a coincidence. I took the book and flipped it. It came to a dialogue where the Swami was saying " You are that Peace. The thoughts that come and go are not you. Whatever comes and goes is not you. Your reality is peace. If you don't forget that, that will be enough." I followed Sri Nannagaru to the Bhagawan shrine and then later to the old meditation Hall. In the Hall there was an ethereal peace. Sri Nannagaru was standing in front of Bhagawan's photo and was praying. I was standing behind him and was thinking "It is so peaceful. I must be this peace. I am not the vasanas, the prarabdha nor the evil thoughts. I am this Peace. If I can hold onto this Peace, I will have attained Truth." No sooner than this thought ran through my mind than Sri Nannagaru turned around smiled at me, patted my cheek two times and left Ramanashram. I met Mr. Alan Jacobs for a while after that and then left Tiruvannamalai. One of my fellow passengers was a new devotee and had told Sri Nannagaru that she was unable to understand his Greatness. He had blessed her and said that she would know soon. I had told her " The God that you worshipped in all your lives has come to you in the form of Sri Nannagaru in this life."